I travel frequently and I travel for many reasons. One is becaase I love exploring parts of the world I haven’t seen or experienced before. That’s why I rarely visit the same place again. But there’s a few resorts that I don’t mind going back again and again; Shereton Sengigi Beach Resort is one of them. 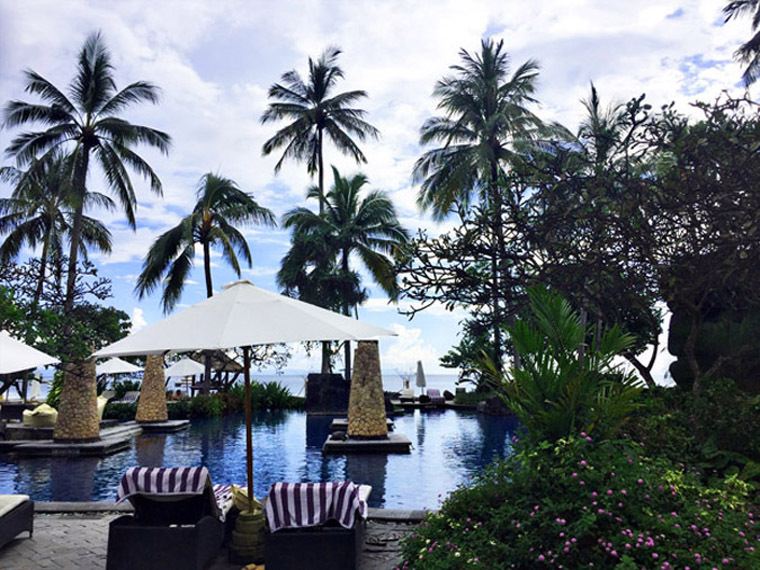 I loved the weather, the view, the pool, the adjoining beach, the friendly staff and the sumptuous breakfast spread. Every morning, I’ll have traditional jamu drink served in a small wooden cup. Normally, Jamu concoction can be rather bitter. However, at Shereton they’ve adjusted the taste to suit foreigners palate. 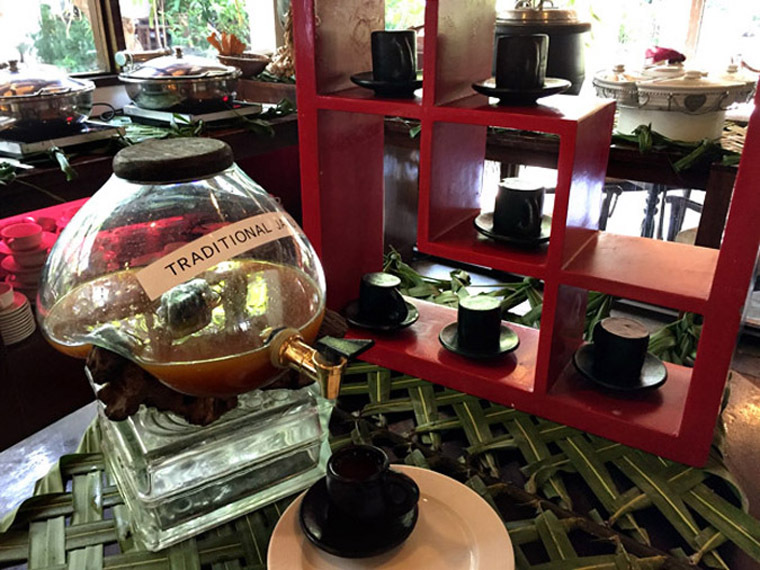 The herbal tonic balanced with a tinge of sourness from asam and sweetness from palm sugar. Sometimes, I was told, orange juice is added for a more pleasant flavour. During my last visit in February, I had a cooking class with Chef Masnin and asked for the jamu recipe. He told me to have one glass every morning for general health and beauty. I’ve experimented a few times, and finally got a recipe that taste exactly like it. Step 1 PREP: Preheat oven. Gather all materials. Fill pot with 5 litres of water. Peel ginger: Slice into 1 cm, line on tray and bake in the oven for 15 minutes. Peel and slice turmeric. 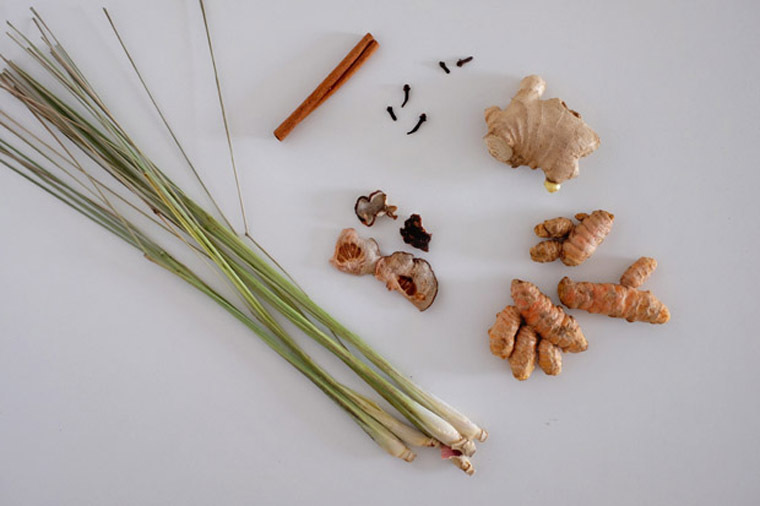 Slice off the top of the lemongrass and leave only the bottom stalk (about 8 cm), peel off any dried-out layers and smash the end with a rolling pin/ pestle. Step 3 SWEETEN, STRAIN & SERVE: Then add palm sugar and let it dissolve. Mix well and strain. Serve hot or chilled. 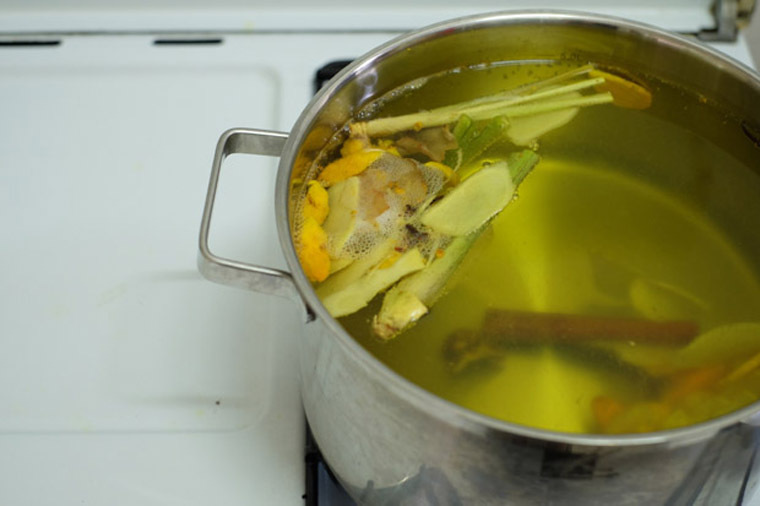 Boil 5L + 100 g baked ginger roots + 100 g sliced turmeric + 5 stalks lemongrass + 5 cloves + 1 cinnamon + 4 g asam keping + 100 g palm sugar. Simmer uncovered until water is reduced to 3 L (2 – 3 hr). I’ve tested the recipes a few times. I realise that you have to take time to boil it, otherwise the flavour not be released and the taste will not be right. Do not rush it. Simmer slowly. Having said that, some people prefer a lighter taste (such as my girlfriends who rarely have spices in their food). The fresher the herbs, the better. I’ve purchased a huge amount of the ingredients and made it a few times in two weeks. The first time, when I slow boiled it with fresh herbs produced the best tasting drink. Do wear gloves if you don’t want the turmeric to stain your hands. My fingers were yellow for days; many thought I got injured and had put on ointment on my hands! I like to peel my turmeric and ginger under running water with the end of a spoon. This way, the skin comes out easily. The drink will stain glasses. 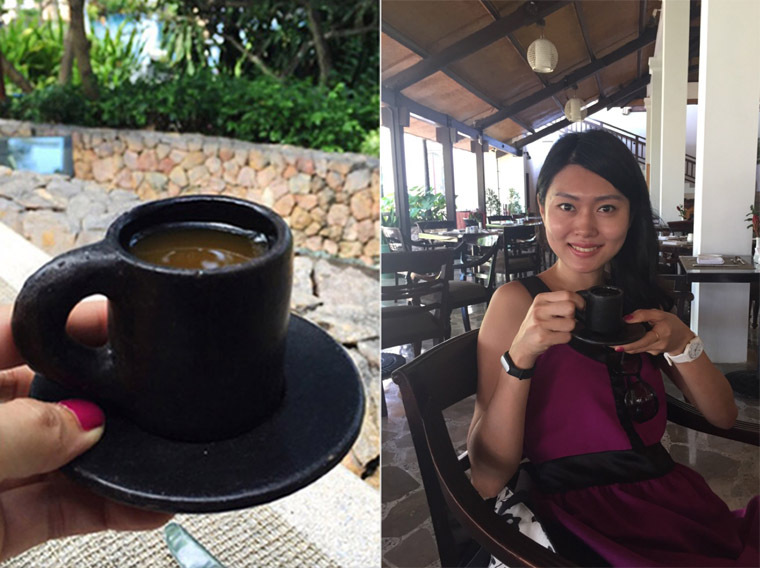 This explains why at Shereton Sengigi Resort, the drink was served in dark wooden cups. Avoid serving in your nice glasses and wash cups thoroughly to avoid yellow stain. Do adjust the taste on your own – add less asam keping if you want it to be less sour and more sugar if you want it to be sweeter. I’ve used two different palm sugar, and realise that the level of sweetness is different. Store in glass container. This drink will stain plastic containers. What do you drink to keep yourself healthy and beautiful? Can i use tamarind paste and how much should i use? Yes you can. I have not tried it in this recipe so I don’t know the exact measurement. 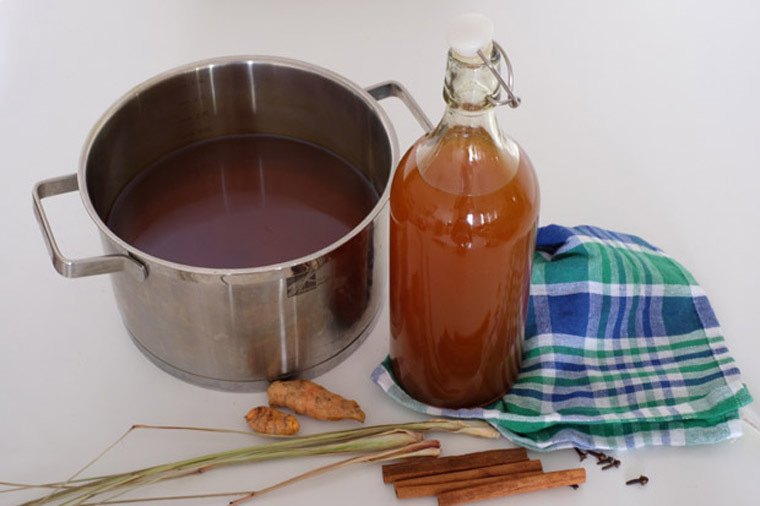 Tamarind gives it a tart/sour taste to balance the pungent/bitter herbs. What you can do is: after you’ve boiled everything, put in the paste bit by bit until the tonic becomes palatable/ a bit sourish. Good luck!